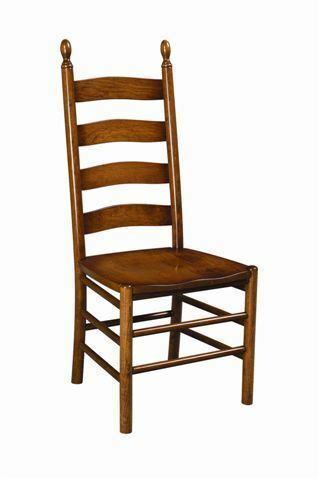 Of all our dining room chairs, the Galloway Shaker Ladder Back Chair is our all time best selling chair. With the adored simple shaker style, this dining chair is all about comfort, service and straightforward style. Lightweight and lovely, shaker furniture is all about strength, function and beauty, and this best selling chair accomplishes every goal with grace. This shaker chair features the wide horizontal rungs it's loved for, with rounded finials adding just a touch of fancy. The legs and stretchers are slim and sound and the seat is scooped to provide ultimate comfort while sitting and dining. The Galloway Shaker Ladder Back Chair is completely customizable and it's handcrafted to provide just the right look for your dining room or kitchen. We offer a large collection of shaker style furniture. This furniture style adapts easily to different room scenes. These shaker chairs make a nice match with the Amish Edinburgh Extension Leg Table. You've found the connection to solid wood furniture online here at DutchCrafters. We are rated the #1 online retailer for Amish furniture. We thank you for taking time to shop with us. These Shaker Ladderback Chairs are comfortable, durable and simply gorgeous and will last for decades. Please email or call us with any questions. Enjoy your new Amish furniture. Note: Customers can also provide their own fabric or leather. I have spent all morning cleaning the dining room to prepare for the dining room chairs. I was not disappointed. They are the most beautiful thing I have ever owned in my entire life! I appreciate your wonderful customer service and, as promised, I have attached some pictures. They stain you helped me pick really matches the cherry table almost perfectly. And doesn't the red hue of the stain go so wonderfully with my red walls? Thanks very much for the soap. We are very happy with the ladder back chairs that arrived last Friday. Garry Blevens could not have been nicer. It was great that he gave me an exact time for delivery. That can be very hard to do up in NH! Thank you for everything. The experience with you and JMX was great. You were very helpful and great at following up on things. If I have an opportunity to recommend JMX I certainly will. When you order things sight unseen it can be hard, but it worked out great.